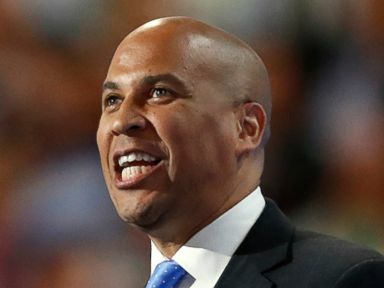 Sen. Cory Booker officially joined the crowded field of Democratic presidential primary hopefuls Friday, the latest step in a near-decade-long journey toward an anticipated campaign to be the second African-American U.S. president. Booker's announcement arrived in a video outlining a theme of unity and togetherness, describing an optimistic vision of what could be accomplished through "courage" and "collective action." "I believe that we can build a country where no one is forgotten, no one is left behind; where parents can put food on the table; where there are good-paying jobs with good benefits in every neighborhood; where our criminal justice system keeps us safe, instead of shuffling more children into cages and coffins; where we see the faces of our leaders on television and feel pride, not shame," said Booker, after describing his upbringing. "It is not a matter of 'can we,' it's a matter of 'do we have' the collective will, the American will? I believe we do," he said. "Together, we will channel our common pain back into our common purpose. Together, America, we will rise." In his first tv interview, on "The View" Friday, Booker further outlined his decision to run for president, explaining that he feels "Americans are losing faith in this country's ability to work for them" and that "people are feeling left out, left behind." "I think a lot of folks are beginning to feel that the forces that are tearing us apart in this country are stronger than the forces that tie us together. I don't believe that," Booker continued. "So, I'm running to restore our sense of common purpose, to focus on the common pain that we have all over this country." The senator went on to defend his optimistic outlook during an era of nearly unparalleled political division following President Donald Trump's election in 2016. "I'm proud of not only who I am and my conviction, but this is a time where too many people, I think, are trying to pit people against each other," he said. "Where the Democratic Party -- I don't want it to be defined by what we're against, but by what we're for. I don't want it to be defined by beating Republicans but by uniting Americans." On an interview on "ABC News Live," Senior Reporter Devin Dwyer noted Booker has made a point of saying he's the only senator who goes home to an inner-city neighborhood. "Do you think your peers are out of touch with the inner-city experience? Dwyer asked him. "I’m not saying that at all. But I’m the only one in this race who had to run and manage thousands of employees, a city in the middle of a recession, which was a depression for inner cities. We managed through crisis and we achieved things people said we couldn’t do," Booker answered. "I’ve stayed put in the neighborhood where I first got my start and will never forget the people that believed in me and gave me my first chance. I do live with a sense of urgency," he said. "I had a young man shot with an assault rifle on my block last year. I go to my bodega around the corner from me and see people who work full time jobs but still use food stamps. Every single day I live with that sense of urgency that we’ve got to solve these problems, and the knowledge that we can’t solve them divided." The launch of Booker's campaign on Feb. 1, the first day of Black History Month, appears not to be a coincidence, particularly after Sen. Kamala Harris' similar commencement of her presidential run on Martin Luther King Jr. Day. In addition to Harris, D-Calif., Booker joins Sens. Elizabeth Warren, D-Mass., and Kirsten Gillibrand, D-N.Y. -- with whom Booker is close personal friends -- as members of the Senate seeking the Democratic nomination. At least five other Democrats have also declared. Though he has visited several early-voting states in recent months, including a trip less than two weeks ago to South Carolina for Martin Luther King Jr. Day, Booker continued to publicly downplay the assumption he'd arrived at a final decision. During a trip to Georgia in January, former President Jimmy Carter told Booker he hoped he runs for president, a moment captured by the senator on his Instagram story, in which he thanked Carter and said, "You encouraging me means more to me than you can imagine." Booker's announcement comes after more than five years in the Senate, which followed seven as mayor of Newark, New Jersey, where he first vaulted to national attention for his youth and hands-on approach in attempting to turn around the crime- and poverty-plagued city. Prior to Barack Obama's election in 2008, some in the Garden State familiar with the ambitious mayor's work, which included frequent ride-alongs with the city's law enforcement and, later, a high-profile education partnership with Facebook, openly mused about Booker's becoming the country's first black president. On "The View," Booker discussed the bipartisan effort required to tackle issues such as affordable housing, describing how he found common ground even when working alongside Republican state leaders. Sen. Cory Booker speaks during the first day of the Democratic National Convention in Philadelphia, July 25, 2016. "I had to deal with people with very strong beliefs and faiths but when we backed up and said, 'Don't you believe in this city we shouldn't gentrify, that we should focus on doubling the production of affordable housing, in a housing recession?' We did it because we excited people's imagination and we found a way." he said. Since arriving in Washington, Booker has attracted attention for his leadership during the bipartisan effort to pass criminal justice reform and for his pointed questioning during Senate Judiciary Committee hearings. That includes what he described as his "Spartacus moment" during Brett Kavanaugh's Supreme Court confirmation hearing last fall. Later mocked by Republicans for grandstanding, the senator exposed himself to punishment by releasing confidential documents. On "The View," Booker called it one of his "prouder moments." "That's the problem with our culture," he said. "We have people getting more and more ratings by tearing down other people. That's now how I'm going to run this campaign … I'm in this race to try to build our nation up." Booker's campaign officially will begin next weekend with stops in Iowa Feb. 8-9, followed by a visit to South Carolina on Feb. 10-11 and a trip to New Hampshire over President's Day weekend, according to a campaign aide. Booker will reject donations from corporate political action committees, his campaign said, similar to Gillibrand, Harris, Warren, former Housing and Urban Development Secretary Julian Castro, Rep. Tulsi Gabbard, D-Hawaii, and former Rep. John Delaney. This report was featured in the Friday, Feb. 1, 2019, episode of ABC News' daily news podcast, "Start Here."